A political campaign created to gain statewide awareness and votes for one hell of a candidate. A ‘roll-up-your-sleeves’ awareness campaign full of solutions for Texas citizens. 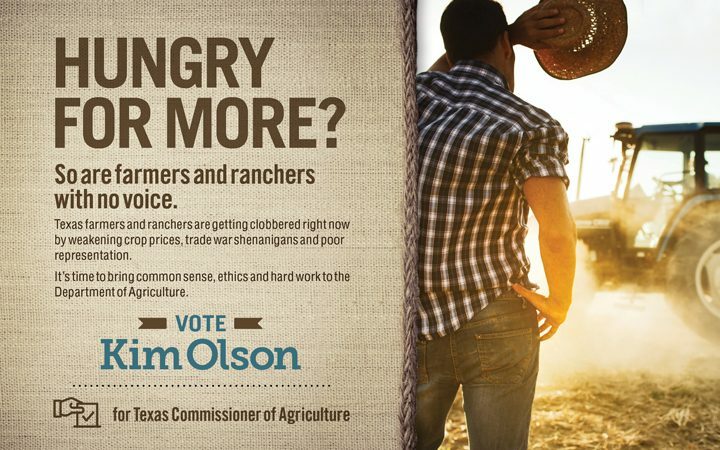 In deep-red Texas, a female Democrat gave the incumbent Commissioner of Agriculture a run for his money. 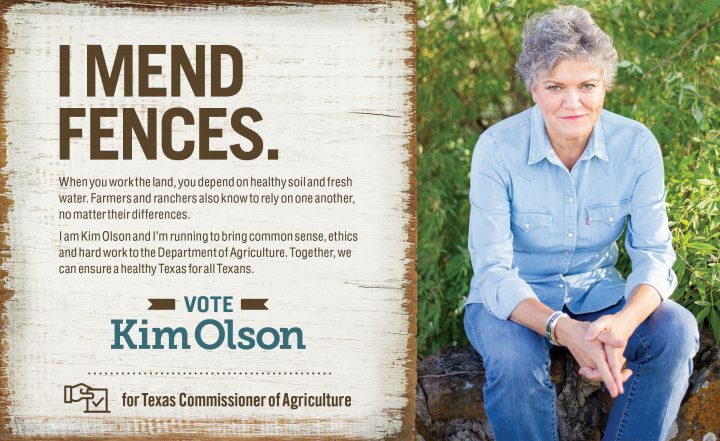 Kim Olson’s campaign focused on her farming experience and desire to move toward cohesive action to support her state. 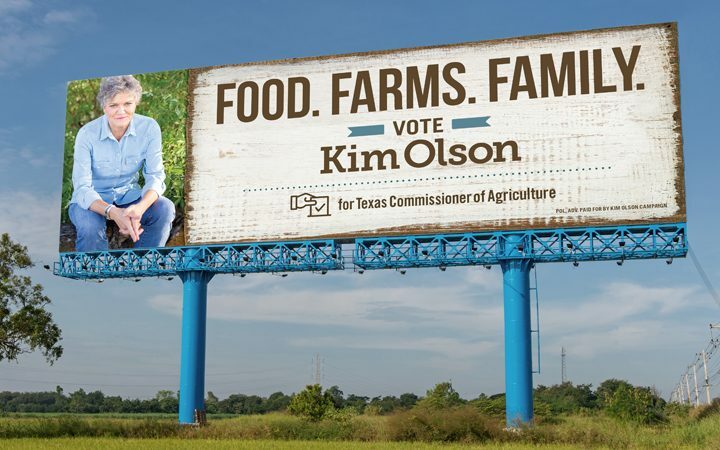 Kim Olson got fed up with the politics that have divided our country and her beloved state of Texas. She is a fourth generation farmer, so agriculture was a natural focus for her. 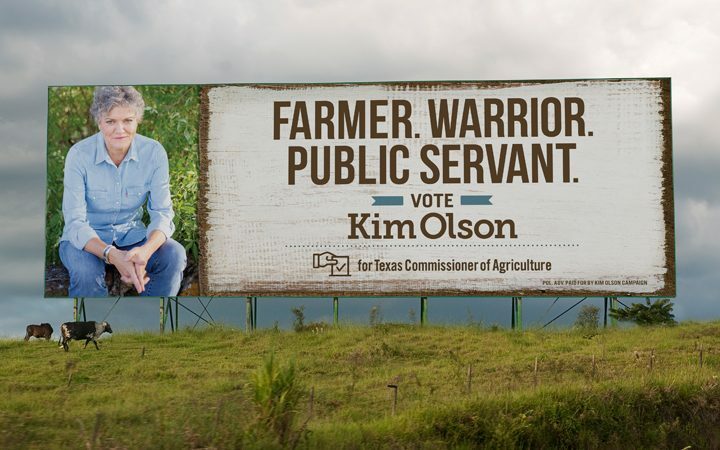 She ran against incumbent Sid Miller as the state’s Commissioner of Agriculture. Miller had gotten a bad reputation for his divisive approach and irresponsible handling of public funds. He also played dirty. But Olson rose above all that. In a statewide race that got national coverage, she needed a campaign boost to amplify her awareness and down-to-earth ideas while giving the people of Texas numerous great reasons to vote for her. 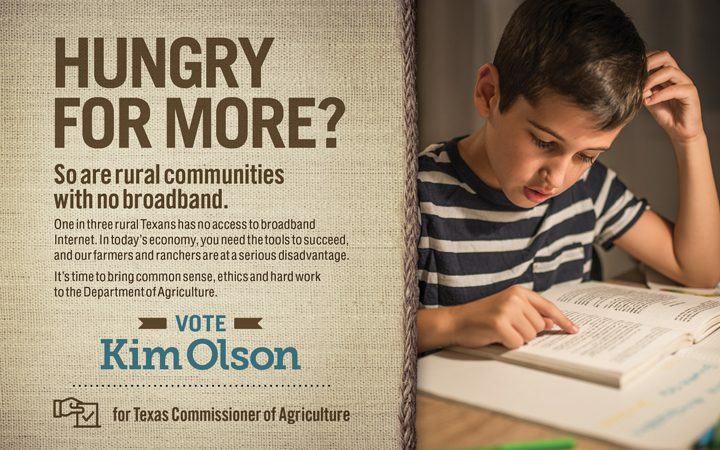 Our campaign messaging focused on issues important to Texas voters: returning ethics to the Commissioner of Agriculture position; providing access to healthy food and broadband internet for rural communities; and getting more rural representation in the legislature. We also wanted to showcase Kim’s common sense approach and cooperative nature. The visual strategy was a simple, straight from the farm or ranch approach, using weathered wood and burlap paired with modern type and iconography. The brown and teal colors hearken back to earth and water and what we have in common, rather than focusing on the expected red or blue and political norms. Wheelhouse was thrilled to team up with Bonehook again to deliver a late-stage strategy, and campaign that presented Olson’s key messages directly and honestly, in an engaging way. 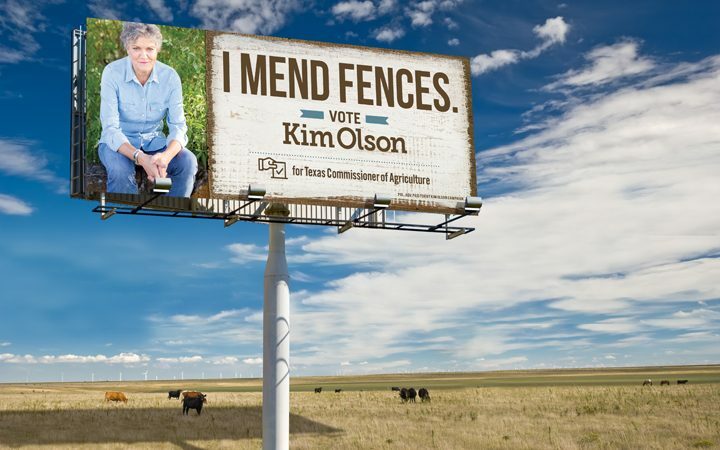 The campaign centered on the message, “I mend fences.” This ‘roll-up-your-sleeves’ direction expressed Olson’s drive for collaborative politics, her desire to bring people together and her agricultural background made her the right person to bring real solutions to Texas families. This core message was spread across the state on billboards and in newspaper ads. Bold secondary messages — “Food. Farms. Family.” and “Farmer. Warrior. Public Servant.” — were also used on billboards. 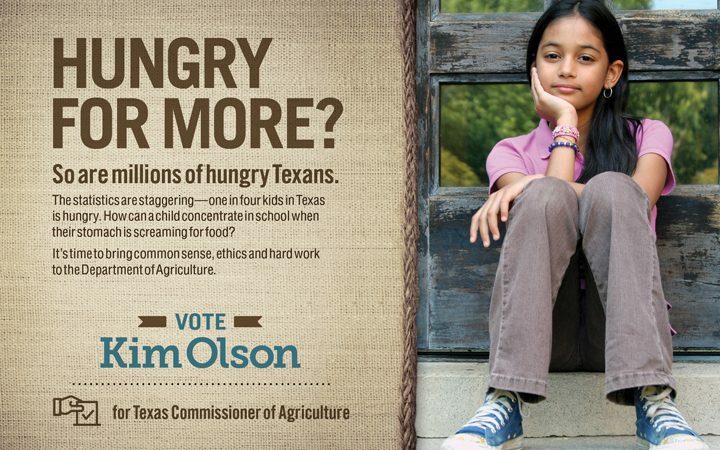 For her social media campaign, we developed ads asking, “Hungry for More?” Both the billboard and social media messages reminded Texans what was central to them, what the focus of the role of Commissioner of Agriculture should be, and why Olson was a solid candidate. Kim’s campaign touched a lot of people. She collected five times the donations that Miller did! While her opponent collected donations from a total of ten donors, Kim received support from thousands of small donors all across the state. Kim succeeded in getting a conversation started and made unexpected headway in a straight-party-ticket state. In the end she came within 9% of becoming the second ever Democratic Commissioner of Agriculture in over 40 years. We were disappointed that victory was not to be this time, but we are proud that we got to help Kim in her fight for the people of Texas! 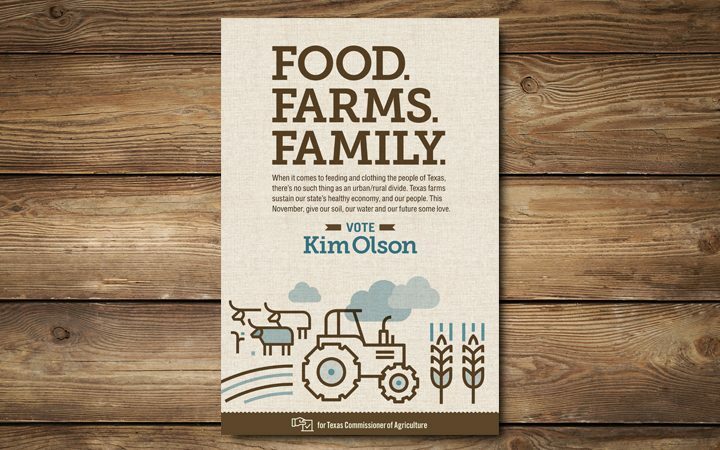 Wheelhouse is proud to have had the opportunity to put our expertise in the service of such an incredible and dynamic candidate like Kim Olson. We believe in the work they do, and we’re honored that they believed in us.